comes together in no time and is perfect with your morning coffee or tea! Happy Monday, friends! 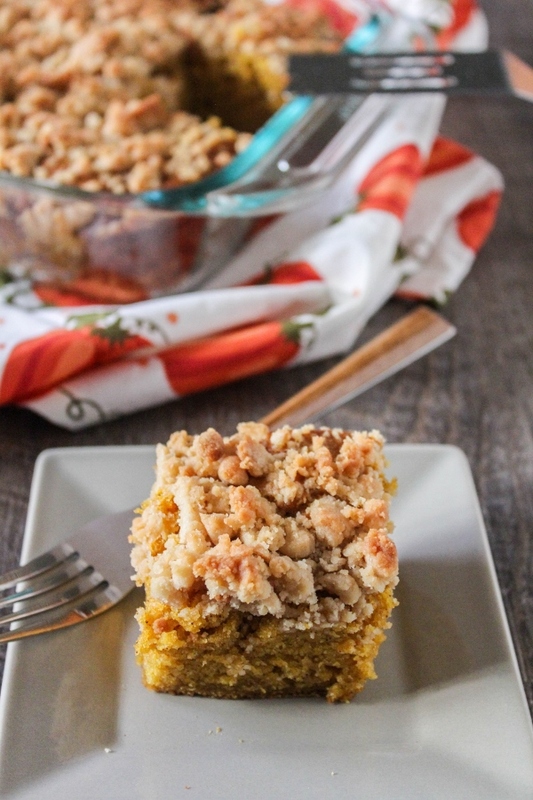 Last week it was all about apples, this week it's all about one of my other fall favorites...pumpkin! As soon as September hits I'm pulling out all the pumpkin stops. Lighting my pumpkin candles, drinking pumpkin spice lattes, and baking all the pumpkin goodies I can dream of. 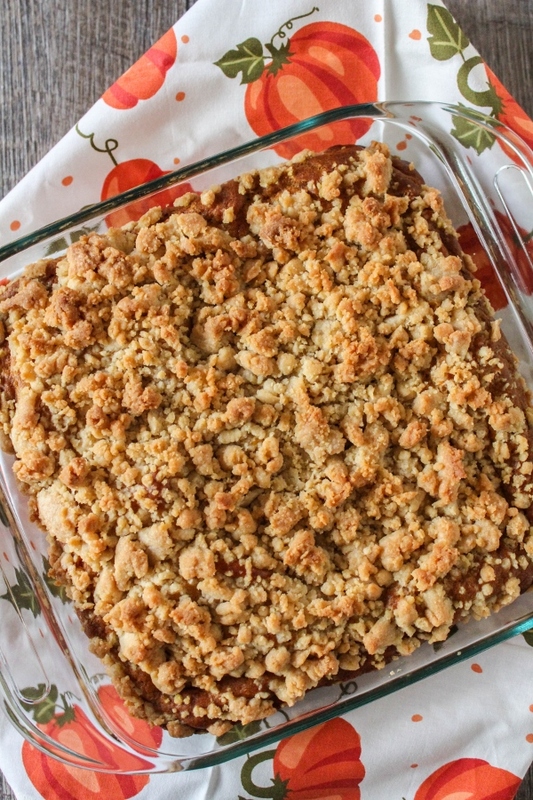 This Pumpkin Coffee Cake is one of my all time favorites because it's such a simple recipe and can be on your table in less than an hour. It's perfect first thing in the morning with a hot cup of coffee! 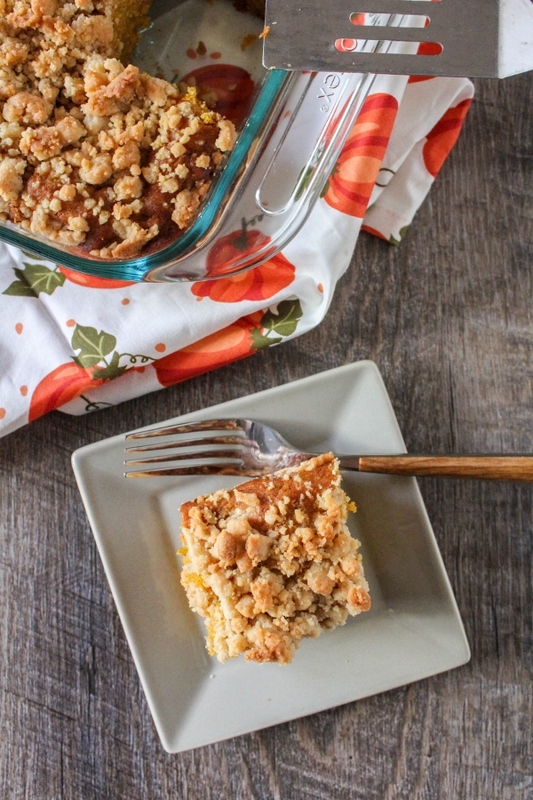 Not only am I sharing a few of my favorite pumpkin recipes this week, but so are some of my blogger friends! Hosted by Terri of Love and Confections, we will be bringing you both sweet and savory recipes to satisfy everyone's love for the beloved pumpkin. 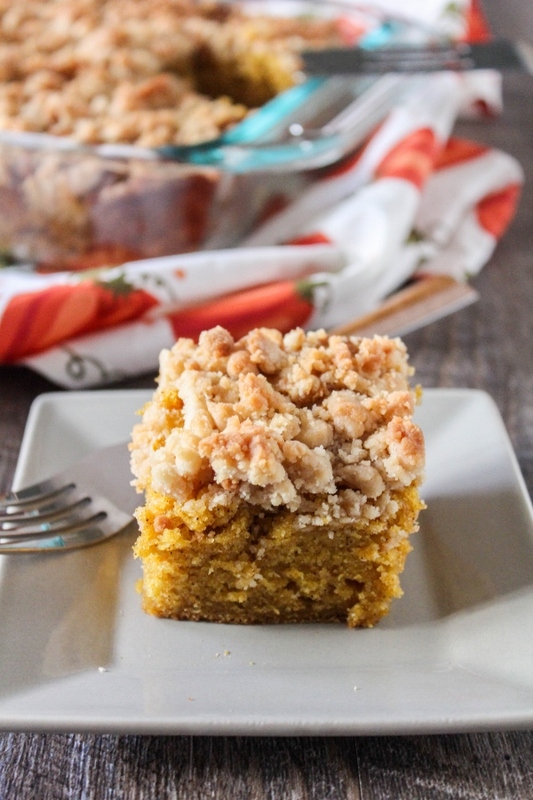 This Pumpkin Coffee Cake is definitely a great way to kick off #PumpkinWeek! Stay tuned for more recipes from me later in the week, and be sure to check out the delicious list of recipes at the end of this post for more pumpkin inspiration! Preheat the oven to 350 degrees. Spray an 8-inch square pan with non-stick baking spray. To make the topping, whisk together the butter, brown sugar, vanilla and salt until smooth. Stir in the flour and set aside. To make the cake, in a large bowl, whisk together the pumpkin, sugar, oil, yogurt and eggs. In a separate bowl, whisk together the flour, pumpkin pie spice, baking powder, baking soda, and salt. Stir the flour mixture into the pumpkin mixture until just combined. Spread the batter in the prepared pan. Sprinkle the topping evenly over the batter. Bake for 35-40 minutes, or until a cake tester inserted into the center of the cake comes out clean. Let the cake cool completely on a wire rack before cutting and serving.